I first met Jon while working for Surf’n'Sun backpackers in Surfers Paradise, Australia sometime in the early 1990’s. Despite polar opposite backgrounds, me from the city and him from the country, we shared a mutual love of life, adventure, surfing (well, me sitting on a board and falling off occasionally) and I guess as two Brits, immediately hit it off. At that time I was promoting waterskiing for the backpackers while also organising people to go out partying (tough job), and Jon had just circumnavigated Australia, on a motorbike, solo. You see Jon is a real-life adventurer, always on the go looking for the next challenge. Sometime in 1999, Jon was visiting me in London and on a beer-fuelled evening, decided his next trip would be to Mongolia, seeking a travel companion this time he was trying to persuade me to go with him. After a few more beers we’d made a deal, having always wanted to climb a mountain myself, it was agreed that if I went with him to Mongolia, he had to join me to climb a mountain. Alas, Jon being a resourceful fellow, he called soon after to say he had found a mountain for us to climb; in Mongolia. Tavan Bogd is located where Mongolia, China, Russia and Kazakhstan all meet and advertised as the most remote 4000 meter mountain in the world. 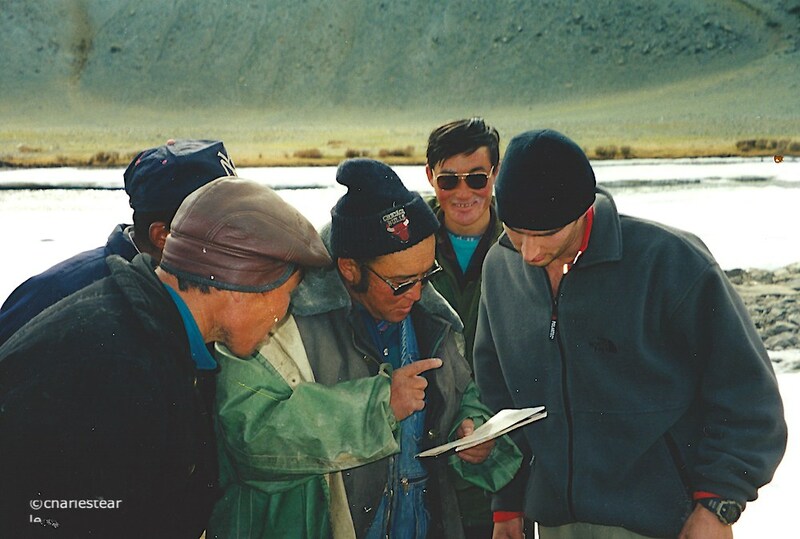 The only information we could find, keeping in mind it was 1999, said you just had to follow the river from the nearest village Khushuut to get there but declared, if you needed rescuing, you were out of luck. In the spring of 2000, with no prior mountain climbing experience or training, we flew to Ulan Bator in Mongolia on the start of our 4 week quest. Upon arriving at Ulan Bator airport we were approached by a local woman with an offer for accommodation at $5 per night staying in her grandmothers apartment, despite our natural scepticism and wary of the scams people people pull at airports, we are also both cheap, so took the deal. Luckily it was a legit offer and soon we were camped out in a local woman’s spare room right in the city. For those that have been to UB recently, it was a different place then, it had one State run hotel, one State run department store that sold everything, masses of homeless kids causing trouble and with so few tourists, nothing (at all) was in English. Trying to work out where to eat became a challenge as menu’s were like reading Martian, or to be more exact, Mongolian. We ordered food by mimicking a pig, or a cow, but it rarely worked and just led to laughter from other patrons, confused but hungry we usually just randomly pointed to things on the menu then looked at our server waiting for them to nod or shake their head. When food arrived we discussed what we thought it might be, often to no avail. The bowl of sheep eyes soup that was put on our table one meal was sent back as at that time we weren’t yet prepared to eat anything, little did we know. Flying from Ulan Bator to Bayan Olgii, the furthest westerly airport, on local MIAT airlines (Maybe I’ll Arrive Today), was itself an adventure in patience, quickly followed by a mad rush elbowing for position, and finally ushered on board when our seat number was called, having no idea what was happening. Think Top Gear challenges, or perhaps more relevant, Dumb and Dumber. Arriving in Bayan Olgii airport was no better, landing in a field and grabbing our bags we soon realised our dilemma and Jon, being the more experienced, made the call “look lost” he said, it didn’t take much effort. We were soon approached and made to feel welcome in a strangers house drinking salted tea and eating a sort of stale donut mix until someone arrived that could translate. Negotiating for a ride to the start of our hike we were eventually piled into a Russian made 4x4 and driven to go find an American living in the village of Khushuut, our start-point on the (guessed) 80 mile hike to the mountain. Not being able to locate the American our driver asked locals for directions to Tavan Bogd and offered to take us 10 miles up river to save us a days walk. Setting off with 40kg backpacks containing all our food and climbing gear, having had no prior mountain hiking experience was soon painful. We shared a water purifier, MSR Dragonfly cooker and a North Face 3 season tent, we weren’t prepared, not even close. Despite the fact we only had to follow the river nothing we could see matched the map we had bought in the capital, after days of nothing making sense, we left the river to follow the compass. Of course, we were soon lost, out of water and frustrated until a local informed us were were in the wrong place and directed us over a mountain range to our desired destination. We blindly set off into the snow soon realising an error in our gear, no snowshoes. It might sound crazy but try to imagine two Brits hiking over some remote snow-covered range in western Mongolia repeating “I’m light as a feather” while hoping not to fall through the thin snow crust. At one point it took around four hours to go maybe 100 meters, me now with a badly sprained ankle from getting lodged between two rocks after falling through the snow and on the other heel, a massive blister on my heel (Nurofen has never been so valuable). Pushing on we made it over the range and ran out of light near the top of the next mountain, intelligently (dumb and dumber go camping) deciding to camp where we were, eventually finding two sort of flat rocks, wrapped ourselves up and tried to sleep, our gear all over the floor. Maybe 2am I felt it, the temperature had dropped, wind picked up and it got much darker, next I realised I was covered in snow, so was our gear. I soon heard the now familiar screams from Jon to get up as we quickly realised we were in a ‘white out’ situation, when you’re in the clouds and can’t tell up from down. Packing everything we could find we sat on our bags, used the ice axes as a rudder and sledged back down the mountain to set up tent. We stayed there for 5 days until the storm passed and later found out the storm was so bad several locals were caught without shelter and died. When sun finally broke through again we packed our gear and headed back up the mountain, convinced, as this was the highest peak we could see, it must be Tavan Bogd. Our goal was almost over. Hiking up Jon took a break with the bags while I went to look over the next ridge, seeing the peak right in front of me, I pushed on, only it was a ‘false peak’, so I pushed on more, then more still. Arriving at the peak I took pictures, patted myself on the back for being so quick and heading down to grab Jon. Poor fella, to this day I’ve never seen him look so frightened, nor angry. I’d been gone over 4 hours and he’d been having visions of me injured, dreading having to call my parents. That night we ventured down, pleased to have accomplished our goal of summiting Tavan Bogd. The next morning, as I took my usual 2 Nurofen to make it past the first few hours hiking, Jon complained of a headache and asked for my last two tablets, assuring me he still had an entire pack left, I handed them over. Later that day we came cross the first people we’d seen for 10 days, seated in their ger, we drank tea, ate some sort of rock hard food and all was good; then as we were leaving the mother motioned her son was sick with stomach ache and did we have medicine? “Sure” Jon exclaimed, as he gave her the last of our Nurofen. I still haven’t, nor will I ever, forgiven him. In the end, it became too much, having relied for 3 weeks on eating 1980’s Falklands Island ex-military rations and instant mash potato, with no protein, our bodies were weary losing almost 20 percent bodyweight and without Nurofen to ease the pain, I could hardly walk. Now lost yet again, Jon negotiated to buy some meat off a local nomad and we sat staring, lovingly, at the boiling chucks, unable to talk due to the rancid smell as we dreamed of food. The meat tasted so bad it would make Bear Grylls puke, yet we had no choice. Soon after we found a stunning and tranquil lake that revived my energy and we pushed on with our return journey, alas soon realising at our pace we couldn’t get back to Olgii for our scheduled flight. Credit to Jon he ventured off into the wilderness and found a nomadic family with a truck, somehow negotiating for them to drive us to Kashuut. A few hours after his return to camp a truck complete with Ger and family arrived, they had packed everything they owned. En route we seemed to pick up every person, goat and curiously a motorbike on the way, until we were all so squeezed into the tuck bed we could hardly move. Upon arrival at the village nothing was better than hearing an American accent, in good spirits we had made it safely after achieving our goal and finally met the American we were seeking prior to our departure. Listening to tales of our adventure he took us on a tour of the area, at one point stopping by a nearby river to admire the immense spectacle of the imposing Tavan Bogd mountain we had just climbed in the distance. In front of us was the biggest, scariest most deadly looking mountain I could imagine, and not the hill we had been up. Confused we explained if this river led directly to Tavan Bogd, where did the river on the other side of town we had followed go? “Nowhere really” he explained, looking at each other in confusion we all realised, we were never even close to the mountain we had planned to climb. Of course seeing the actual mountain, so imposing from 80 miles away, we didn’t care. A few years later I got to climb several 4000m mountains in the Swiss Alps with a local experienced mountaineer I was friends with, after my first climb with supervision I knew if we hadn’t got lost in Mongolia, we probably wouldn’t have come back alive. We made so many errors on that trip, but both came away unscathed with memories and vital experience. Writers note; the title is a little misleading as Tavan Bogd is the only 4000 meter mountain in Mongolia. Our start point, Khushuut, is indicted by the green circle; the blue route leading directly to Tavan Bodg was the route we were meant to take. The red route was the actual route we took before getting a lift a back to the village.